Once you’ve set up mandates, you’ll need to stay up to date as they change. For example, a customer can cancel their Direct Debit at any time by contacting their bank, and you’ll want to reflect this in your product. Webhooks are not suitable for all applications. For alternative strategies, see below. Let’s look at how to build a simple webhook handler. This important foundational work will help us later to take action when things happen to our mandates and payments. 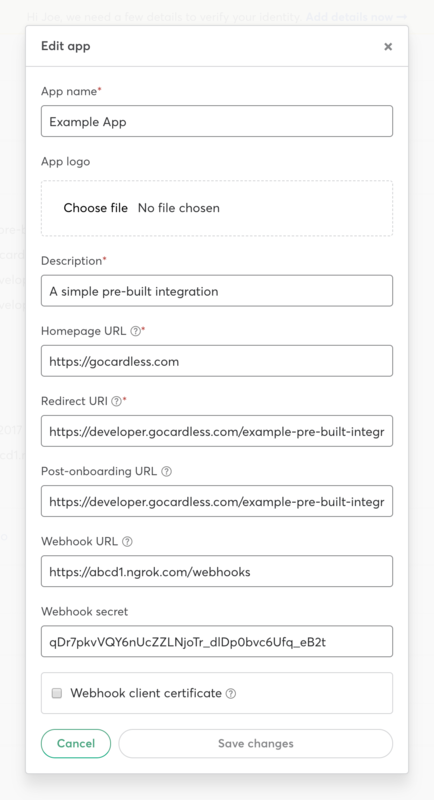 To start experimenting with webhooks, your application will need to be accessible from the internet so GoCardless can reach it with HTTP requests. If you’re working locally, the easiest way to do this is with ngrok. Download it and follow the instructions on the page to install it (you’ll need to unzip the archive, and then make the ngrok binary available in your PATH). Now, just run ngrok http -bind-tls=true <port>, where <port> is the port where your web server is running (for example ngrok http http -bind-tls=true 8000 if you’re running on port 8000). You’ll see the externally-accessible URL that forwards to your localhost - copy it to your clipboard. In the sandbox, you can use an HTTP URL for your webhooks, but to go live, the endpoint must be HTTPS secured. To start receiving webhooks, you’ll need to add this as your app’s webhook URL in the Dashboard here. Simply enter the HTTPS URL from earlier and add on the path where your webhook handler will be available, then click “Update App”. Next, copy the secret from the “Webhook Details” section which will appear for your app. 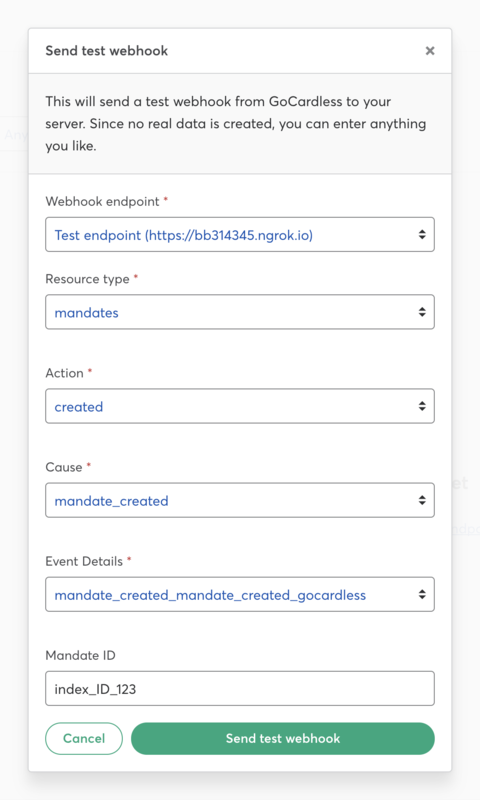 Let’s get started with building a framework for handling webhooks - it’ll handle the webhook event GoCardless sends you when a customer cancels their mandate. The body contains one or more events, specifying the type of the resource affected (e.g. “mandates” or “payments”), its ID, the ID of the organisation the resource belongs to (which you stored when obtaining their access token) and the action that occurred (e.g. “cancelled” or “expired”). The first step to take when you receive a webhook is to check its signature - this makes sure that is genuinely from GoCardless and hasn’t been forged. A signature is provided in the Webhook-Signature header of the request. We just need to compute the signature ourselves using the POSTed JSON and the webhook endpoint’s secret (which we copied earlier), and compare it to the one in the header. If they match, the webhook is genuine, because only you and GoCardless know the secret. It’s important that you keep the secret safe and private. # Handle the incoming Webhook and check its signature. Look up the ID in your database to make sure you haven’t processed it before. You’ll need to keep a record to make sure you only process each event once. Respond with a successful response (204 No Content). If you respond with an HTTP error code, or the request from GoCardless to your server times out, GoCardless will retry up to ten times at increasing intervals. # Handle the incoming Webhook and perform an action with the  Webhook data. // the processing of each event asychronously to avoid timing out here. // the most up-to-date information about it. In the Dashboard, the “Send test web hook” functionality makes it easy to start experimenting with webhooks. Select your app, set the “Resource type” to mandates, the “action” to cancelled, the “cause” and “event details” to whatever you want and enter an organisation ID. Then, click “Send test webhook”. GoCardless will make a request to your endpoint, and full details of the request and response will appear in the list - click on it. If everything’s working, you’ll see a response code of 204 No Content. We’ve now built the basic structure of a webhook handler. In the next section, we’ll look at how to effectively handle the most important parts of the lifecycle of a mandate. Using TLS enables us to encrypt data in transit. However, additional security can be achieved by using client authentication in addition to server authentication. Client authentication adds an extra check in the TLS handshake to validate that the client is authorised to access the endpoint. In this case, it enables you to be certain that it is GoCardless making a request to your webhook endpoint, and not (for example) a malicious entity attempting to spoof GoCardless. 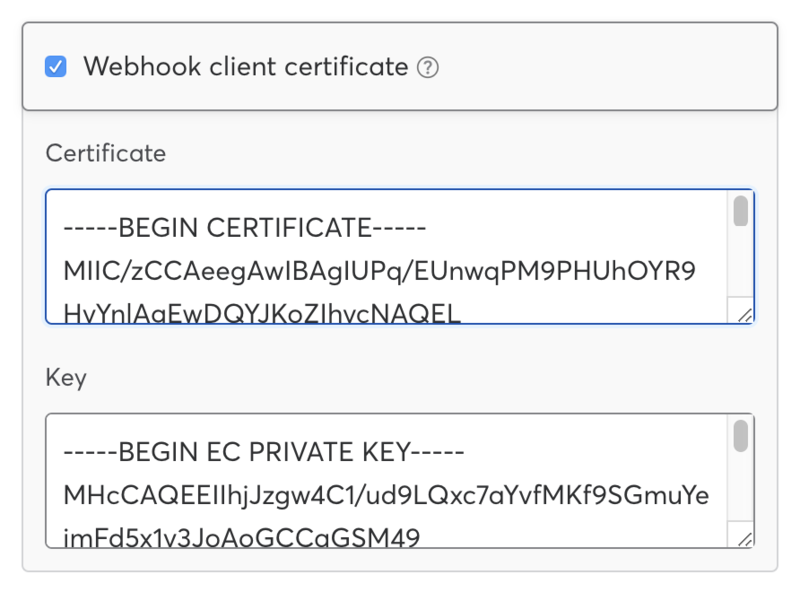 To authorise GoCardless to send webhooks, you need to provide a valid certificate and private key issued by your certificate authority. In practice, this can be a self-signed certificate, and useful instructions for generating certificates can be found on the CoreOS documentation website, using Cloudflare’s cfssl toolkit. We recommend setting a long lifetime for the certificate to avoid unnecessary management overhead. Once generated, the certificate and key must be entered into the webhook endpoint form in the developers section of the GoCardless dashboard. Both certificate and key must be provided in base64-encoded PEM format. All subsequent requests from the webhook system will be client-authenticated. The main disadvantage to using this feature is the overhead of creating, renewing and otherwise managing client certificates. It is up to you to balance this overhead against the additional security risk. While the webhook system is the best way to keep your integration in sync with the transactions taking place on the GoCardless platform, it is not ideal for all use cases. Webhooks require - by definition - some part of your integration to be accessible on the public internet. This is a very good fit, for example, for web-based software-as-a-service applications. However, rich-client native apps will not usually be able to use webhooks. For on-premise software deployed on a private network, it is necessary to deploy a publicly-available proxy, which may not be practical. Please note that some features - for example, handling customer notifications - require you to use the webhook system. It’s also worth noting that the majority of events are created when we receive (8-11am BST) and send (3-6pm BST) reports to the bank. Therefore we usually suggest querying the endpoint around midday, then in the evening and any other periods you wish.